World AIDS Day is held on the 1st December each year and is an opportunity for people worldwide to unite in the fight against HIV and show their support for people living with HIV. World AIDS Day was the first ever global health day, held for the first time in 1988. The day provides us with the opportunity to remind ourselves that HIV has not gone away and that collectively, there is the need to increase knowledge and awareness and to continue to fight prejudice, stigma and discrimination. Statistics South Africa (Stats SA) estimates that 51% of the SA population is female and about 30,1% of the population is younger than 15 years old. Stats SA estimates that 18.9% of the people aged 15–49 years is HIV positive. (Stats SA, PO302 – Mid-year population estimates 2016, published 25 August 2016). In South Africa the proportion of population aged 15-24 years with comprehensive correct knowledge of HIV/AIDS 2002 -56%; 2012 – 24.2% (Millennium Development Goals: Country report 2015 / Statistics South Africa). Given this objective and these statistics, SSA runs HIV and AIDS awareness and behavioral change programmes as part of its Scout Advancement programme and promotes it amidst the adolescent and young adult membership. 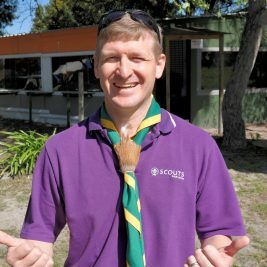 The SCOUTS South Africa “HIV/AIDS awareness programme” is not new. It’s been running since 2002 and is available to all Scout Groups nationwide. By expanding their knowledge and raising awareness about prevention amidst their peers, Scouts can earn a badge. The programme also talks to eliminating prejudice and stigma. When an external evaluator assessed our programme he stated: “It is a well-designed package of HIV prevention interventions. The Scouts programme is unique in that it presents knowledge about HIV in the context of a supporting system of values, life purpose, group norms and identity. Furthermore, young people gain a strong sense of belonging and identity from their participation in a Scout troop. This exerts positive peer pressure. Younger Scouts generally have a high regard for their patrol and troop leaders. It is from these trusted sources that they repeatedly receive messages about positive masculinity, gender sensitivity, human rights and behaviors which protect them against the risk of HIV infection. This is underpinned by an appeal to the higher values and norms embodied in the Scout Law and Promise to which they repeatedly subscribe. The HIV and AIDS programme materials are available in Regional Scout Shops nationwide.